"Not every great juggler is a great player, but every great player can juggle." Learning to juggle is not easy. To get good, you have to work on this at home. That grows your ability to focus on soccer and helps you to develop the habit of training on your own, “when no one else is watching,” something all good players do. When you can juggle, it has an amazing impact on making your 1st touch more productive. The ball goes right where you want it to go with that touch. But juggling will also improve all of your other touches on the ball. Good jugglers always have confidence in their ability to control the ball with either foot. How much time do you think Neymar spend juggling the soccer ball as a kid? I'd say he spent at least an hour or more per day. And I bet he just loved juggling and trying to make the ball do what he wanted it to do. The test: take four tries, then add the best two together. That’s your score. Move to the next level when the score reaches 100. Level 1 (Bronze): "Any Touch" counts (even one that bounces off the chest or nose!) The ball starts from your hands, but you get a 0 for the try if you catch or touch the ball after that. Level 1 is all about developing balance and rhythm, so juggling the ball on your thighs is OK.
Level 1½: "Mostly Feet" Some use this to transition from juggling on the thighs to juggling with their feet. You can count touches on a thigh, but not two in a row. Example: thigh, foot, foot, thigh, thigh, foot, thigh, thigh, thigh, foot is a “7”. Level 2 (Silver): "Feet Only" Any other touch ends the turn. Now the ball starts on the ground, but you get a do-over when you don’t get at least three touches on a try. Practice the “lift” and the weak foot juggling separately at first. The hard part in these three levels is getting to 15 touches on every try. After that, 25 come quickly, then 50 even faster. 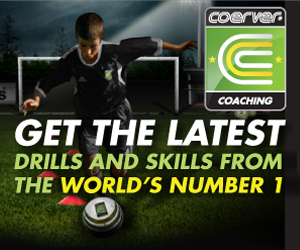 Nothing will make you better faster than finishing "Weak Foot Only"
Level Four (Platinum): "Progressive" Four tries using feet only (any other touch ends the turn) in this exact pattern: right – left, left – right, right, right – left, left, left, left (that’s a score of 4), - etc. Move to the next level when the score reaches 15 (120 touches) on any try. Practice tip: sometimes start at 12. Players with great touch – and that will be you when you’ve completed this Juggling Progression - possess neuromuscular pathways that do much of the work of ball control, as if by instinct. You seem to be playing smarter. But what has really happened is that you have freed up parts of your brain to focus on all the other elements of the game, anticipating what’s ahead, reacting and playing faster. And that gives you a monstrous advantage on Game Day. 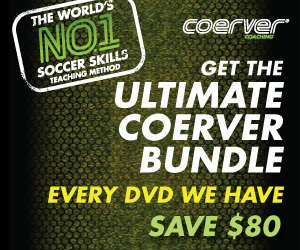 Source: This article is from "The Coerver Minute" by COERVER Colorado's Bill Dooley.